My guest is Brian Scudamore. Brian is the founder of 1-800-GOT-JUNK. 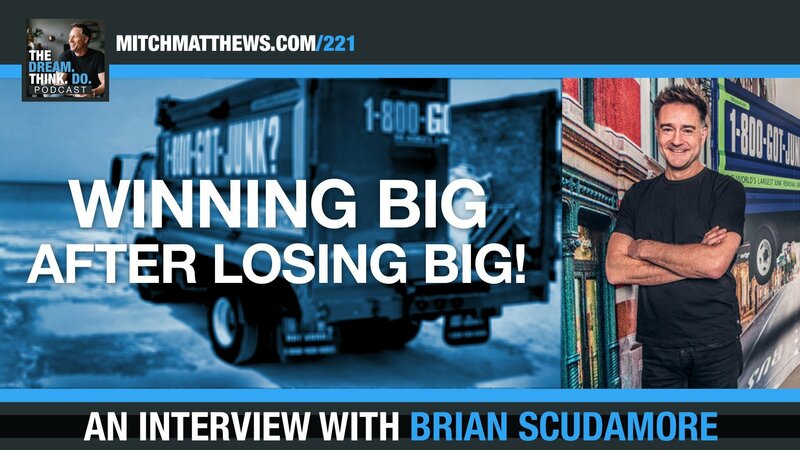 Brian and his team have grown 1-800-GOT-JUNK into the world’s largest junk removal service. Not only that, they scaled that bad boy and started three more home service brands.He’s got his eye on $ 1 billion. He’s living the DREAM THINK DO life… so let’s get to this! Brian Scudamore: Thanks for having me, Mitch. Mitch Matthews: Let’s talk about how this got started. Mitch Matthews: Get ready, dad. Brian Scudamore: He says, “how is that good news?” I gonna learn so much more about business running one, instead of studying from textbooks, from professors that have never started a business in their life. While my dad did not get the good news train, 10 years later he sat down. He said, yeah, Brian you did the right thing. Mitch Matthews: Good, good call. But obviously this willing to fail was something you were willing to do early on. Would you say that … At what point would you say this started to set in that being willing to fail was key. Brian Scudamore: I think I’ve always been a bit of a risk taker as an entrepreneur. I grew up with grandparents who had a small business. Now they … It was an army surplus store in San Francisco. I used to work there every summer and Christmas vacation. I don’t think they took a lot of risks. But I enjoyed the game of business and was fired to take that entrepreneurial leap. Maybe it was just a part of my DNA. I don’t know. But I found myself whenever I was starting a business, I didn’t mind putting myself out there and making some mistakes. It just felt like the fastest and easiest way to learn. Brian Scudamore: Five years into my business, to the half a million in revenue, I felt good about what I was building. But not good about the people on board. That old phrase of one bad apple spoils the whole bunch. I probably had … Nine of my 11 employees were bad apples. It was a leadership moment for me to get rid of the entire crew. I brought all 11 in and I said, sorry guys I’ve let you down as your leader. I have not given you the love and support or found the right people and fired everyone to only start again. But to take that leadership lesson of, okay I failed here. This hurts. I’ve gotten rid of my entire company. Yet starting again there was that valuable lesson and it got better. Mitch Matthews: Not bad. Well, That’s … I love that story in the book. That took some guts. As I’m sitting there, here you had to be thinking, oh gosh this is rough. This is embarrassing. Also you had to look down the barrel of running the business solo for a while, too until bringing on the right people. But, that’s the kind of thing where that took guts at the time where you needed it, right? ‘Cause you could have just kind of tried to maintain it with status quo. I’m guessing you would have been a completely different place today. Brian Scudamore: Yeah. We learned or I learned that day ’cause it was just me, that building a company is all about finding the right people and treating them right. The company would not be what it is today. Today will … This year we’ll do $440 million in revenue. There’s no way we would have come anywhere close to that hadn’t we found this important mantra of finding the right people. For someone like ourselves heavily branded in everything we do, my converse right now have O2E brands on the side. Brian Scudamore: My truck has all the decals of all the different brands on it. Looks almost like a NASCAR. For someone as heavily branded as we are, the first thing you see when you walk into the junction, the head office is a sign that says it’s all about people with my name Brian Scudamore below it. That’s our commitment to just always find the right people. We are slow to hire, quick to fire. It’s always about hiring on attitude, training on skill. I think most companies unfortunately don’t get that and that … there in lies the source of, I believe, a lot of their problems. Mitch Matthews: But don’t you think that part of the pain of having to let those 11 people go … I’m guessing there was a part of you that said, I’m never freaking doing this again. I’m never going to put myself in this kind of position. It’s kind of that pain of that failure probably again drove you to do it differently. Brian Scudamore: Of course. The pain was there and it hurt. This wasn’t just ripping off a bandaid. This was … Every ounce of my being was in pain because I went from a half a million in revenue and five trucks down to one. A human being can drive at one time. There I am going, oh my gosh, what have I just done? I really … I try and reflect and remember what it was like back then. But it’s hard to remember that far back. It was probably three, maybe six months before I had to rebuild and had enough staff and had good people now to take it to the next level. But I saw every person as an opportunity to be a part of building a great culture and for us having fun together. I lost the fun element in my business at the time when I made the decision to get rid of those 11 people. Mitch Matthews: Well, here’s the thing. We’ll put all the links in the post as well. But guys, you need to go check out Brian’s websites because you can see the culture that he’s created, all of that. But I’m guessing … Here’s the thing, as dream, think, doers, they’re listening. I’m guessing that every one of them as they’re listening to this, maybe it’s not that they’ve got to go and fire their whole team, but I’m guessing everybody just thought of something where they’re, oh wait, I know I got to go do that, right? I gotta go make that stand or I got to make that. In the book, you really do walk through your story. It’s great. I love it. It’s a great combination of stories and strategies so that the strategy stick ’cause you remember the stories. Mitch Matthews: But let’s just talk to that dream, think, doer right now as far as … Maybe just in their hearts something just ping them … I gotta do that. I gotta make that change. Probably the risk or the feeling, the fear of the risk starting to set in. What are some of the things you do to help people identify where they should take those risks ’cause you’re also not just running around doing crazy stuff and all of that. It’s calculated. But what are some of those things? Walk us through how you help somebody break down the type of risks they need to take. Brian Scudamore: Number one is trust your gut. I think we honestly know when we’ve got the wrong person on our team. We know when we’ve compromised and made a miss hire. When we get out there and try and find friends, you don’t run through a list of qualities you’re looking for and check, check, check. They like Canadian beer. They love to ski. You just find people you connect with and you have a sense that they’re good people and that you’ll get along. With employees, we don’t do that. With employees, we will say, oh, it’s so hard to find people in this labor market. I just need a body in the seat and we compromise. We know we’re making a bad decision. But I think if you look inward and hold up the mirror and say, okay, do I really have the right people to build something special here? Do I really have the right people that will help me achieve my dream, our vision? Call yourself on it. Brian Scudamore: Call yourself on the BS and just to say, you know what, I got the wrong person here. I need to make a decision. You mentioned the book, WTF, Willing to Fail. It … What’s been interesting is I’ve had hundreds of emails from people that have told me the difference the book’s made to them, which … Check on my list. Goal accomplished. I wrote it to inspire and share our 30 years of learning. But it’s always different stories and different examples that are resonating with people because what they’re doing is they’re saying, oh Brian, I could really feel your pain when you fired 11 people or I can really feel your pain when you had to get rid of that COO best friend of yours. It depends what someone’s going through and what stage they’re at in their business. But the beauty about entrepreneurship or about being a leader is we all go through problems that others have faced. Why not learn from someone else’s problem so you too do not have to do the hard things the hard way? Mitch Matthews: That’s one thing I was going to say about the book that I loved in that it read like a story with strategies tucked in. But it also read like a very eloquent thank you note as well ’cause you really did tip your hat to a number of friends. People that really have made an impact on you, mentors, all of that. It was obvious that you were … you’ve been surrounding yourself with the right kind of people. That’s been intentional. I love that you got specific about some of these people. Some of them are still with you. Some of them have taken different trajectories, all of that. But kind of honoring that process. Speaking of people, speaking of those that you’re surrounding yourself with, I also want to go back to one particular story in the book. Mitch Matthews: I think dream, think, doers will really appreciate it. But it … Around that same time of firing the 11 kind of … you are going through a business identity crisis. You gave yourself a little time to get away. I want to talk about that process because I think, especially on the dream side, we talk about dreaming bigger, thinking better and doing more. I think a lot of people love the idea of dreaming. But they don’t always give themselves that space or the … That permission to dream. You did that. It made a big difference. So tell us that story and let’s talk about that as a strategy. Brian Scudamore: It came out of a personal failure. Creating a vision, a picture of where I wanted to go and where I could go. A process of creating what I called the painted picture was born out of a moment of depression. Not even just a moment. But a period in my life where I was comparing myself to others. As a high school dropout, who talked his way into college, who ultimately dropped out of college, my learning became from a group around me. I’d surround myself with mentors, people from … who became friends of mine, close friends at the entrepreneur organization. I joined EO and the failure I did, the mistake I made was I started comparing myself to others. Brian Scudamore: I was surrounded by all these awesome entrepreneurs who had way sexier businesses than junk removal. They had $10 million companies. They had a $100 million companies. Then there’s Brian Scudamore with this beat up old pickup truck, little million dollar business. I thought, oh man, who am I? I failed school. I’m failing in business. I’m not growing to my full potential. I went to my parent’s summer cottage about an hour away from my home base in Vancouver. My parents have this little cabin on the water. I pulled out a sheet of paper, one page, double sided. I started writing what the future would look like. Not what it could look like or what hope could look like. But I actually said, okay, I’m going to write what I see in my mind as pure possibility. Brian Scudamore: Stop thinking about all this doom loop, downward spiral thinking. Start thinking about possibility. I said we would be in the top 30 metros in North America because Vancouver has 30 cities bigger … Sorry, there’s 30 cities bigger than Vancouver in North America. Vancouver’s where we started. Why wouldn’t it work everywhere else? I said, we’d be the FedEx of junk removal. I said, we would be on the Oprah Winfrey show. I started seeing these big bold ideas. I wrote them all down. By the end of it, I read my painted picture and I went from sheer doom loop type thinking to wow, there’s possibility here. Because my language was, I don’t know if how intentional it was at the time, that would be too smart. But I think it just happened to be that I wrote in words that crystal ball of the future we will be versus saying we hope to be. Brian Scudamore: It was amazing how these things all transpired. Five years, that was the goal. Top 30 metros, FedEx of junk removal, Oprah Winfrey, they all happened. The magic of it was when I started sharing this painted picture with others, one of two things happen. They separated and into a camp of Brian, I don’t know what you’re smoking. This hope dope. This isn’t ever gonna happen. Those people left the business or the other half who stayed and said, wow, Brian, this is compelling. This is exciting. I see what you see. I want to be a part of it. Those became the champions behind us building something much bigger and better together. We hit every one of our goals, which at the time most people thought were crazy. But there were some people that were crazy enough, they wanted it to be a part. Mitch Matthews: I love how you use that as a filter to say, okay, if this seems too crazy, then you’re probably not home here. But if this seems crazy enough to work, then let’s do it, right? That did filter out some people. Now, one of the things that I wonder what that story is with, you … It was a low time. You did get away. It sounds like it’s a nice location to maybe inspire some bigger thinking and all of that. But how would you say … I know that when you’re battling back or especially when you’re in comparison mode, what were some of those things you had to do with your thinking, especially when you were in the messy middle, right? Mitch Matthews: It’s one thing to get the vision. But then I’m guessing that next day you were still dealing with some of those realities, right? Was there anything you had to do intentionally to shift your thinking or to keep that vision alive even when … The Oprah thing was probably exciting. But there probably had to be at least a little of you going, yeah, that’s nuts, right? Or not possible. What would you say are some of the things that you do to cultivate or that you did to cultivate that and probably continue to cultivate that kind of thinking? Mitch Matthews: But a healthy cult. Brian Scudamore: Exactly, right? [inaudible 00:17:33] the word cult as in culture. Think of Google. Think of Apple. Think of Amazon. These are companies that have done big, bold things. They’re guaranteed. Their stories were many times at a much grander scale than anything I’m doing where people around them didn’t believe. But if you did and those people help to push them across the finish line. It’s telling stories in the future as though they’ve already happened here. Here’s a perfect one for you. We accomplished that painted picture. Later in the book I talk about how in 2012 we really hadn’t fully rebounded yet from the ’07, ’08 meltdown. We had a bunch of franchise partners who with 1-800-GOT-JUNK were feeling still a little like ah man, there’s so much potential here. Why isn’t it happening? I said, okay, here’s what we’re going to do. We had a conference. We did it in Vegas. We show up in this big conference room. I told everybody to bring a Hawaiian shirt. We gave them Hawaiian leis at the door and a Mai Tai. Everybody sat down and I asked them to close their eyes. Brian Scudamore: I read them the 2016 painted picture, which said, in four years time we will double our business. We’re going to be celebrating on a beach in Hawaii. We’re going to be drinking Mai Tai’s. We’re going to have our family, our friends, and so on there cheerleading us on. They needed a vision. They needed a place to believe. Now, everybody thought at the time, nah, this isn’t really possible. But as the leader, I had to help them see that, you know what? Of course it’s possible. We’re going to find a way to make it happen. We were on that beach. We did celebrate together and drink Mai Tai’s and rejoice, and look what we’ve created. We doubled … We more than doubled our revenue. We said we’d go from a hundred to 200 million. We actually ended up 224. We surpassed it by $24 million. People thought it wasn’t possible. Sometimes just having a vision is the starting point. Mitch Matthews: Well, it’s that being able to communicate that. I love that. You even made that experiential which is absolutely beautiful, right? But also, I know … With doing a little bit of research. Watching a couple of the videos on your corporate culture. You’re doing things on a daily basis to keep that energy high, to keep that focus going. I know one of the videos I saw was just around a morning huddle. That thing … I felt more energized after watching your morning huddle than I did after some Tony Robbins video. Walk us through that from a standpoint of ways that you’re pulling this through. This is not just a … You didn’t just have that conversation at that conference in Vegas and then four years later look around and say, okay, do we do it? You’re cultivating this on a daily basis. Walk us through a little bit of your culture and how you’re sustaining this kind of thinking. Brian Scudamore: We have a belief in what gets measured gets done. If our destination is doubling the revenue, going to Hawaii and celebrating, there’s milestones along the way that we’ve got to check in on and measure and say, are we on track? If you’re literally taking a vacation somewhere and you’re doing a road trip, you’re measuring along the way. Are we off course? How do we get back on course? What we do is what gets measured gets done. We things on a daily basis. We sit down or actually we stand up at a daily meeting each and every day called huddle. If any of your listeners wanted to check it out, they just Google O2E brands or 1-800-GOT-JUNK huddle and they’ll see a video which shows our seven minutes standup meeting. Brian Scudamore: Now what we do is we talk about good news. We talk about the numbers. We talk about where we’re stuck and missing systems. This seven minute all hands on deck meeting every day allows everyone to literally be on the same page with the progress towards our painted picture. They say best way to swallow an elephant is one bite at a time. It’s just bite after bite after bite every day towards that painted picture. It’s … What I think too many people do is A, as a business or as a leader, they don’t have a vision. But some do. The mistake those … that they make, those that have a vision often is not to review it or share it with others frequently. So on a weekly, monthly basis, we are talking about parts of the vision and the painted picture. That’s the magic or that’s the formula behind the magic. Mitch Matthews: Keep … You bring that down so that everybody’s … They know they’re part of that vision. But it is you’re … you’re celebrating along the way. You’re telling those stories, all of that. I love it. One of the other things I want to dive into, because I know now that the book’s out there, you’re hearing from people. I’m guessing that you’ve got readers all different walks of life, all different backgrounds, all of that. But I’m guessing that a lot of people are resonating with the idea of at least saying, all right, I need to take some risks. I know that some of those might wind up in failure. But it’s definitely easier to do that when you’re flush with cash, right? When things are great. But what about for that person … What are some of the things that you say to that person that’s … They have to take a risk but maybe things are a little tighter, right? It’s that old thing of this feels bigger, right? This feels like a bigger risk. What are some of those things where … How do you guide someone in that type of season? Brian Scudamore: I don’t think they have to be big risks. They don’t have to be big financial risks. They can be risks of getting out of our comfort zone. Picking up the phone and calling someone, an author, a business person, someone that you believe can help you get to that next level. It’s sometimes doing a sales call and knocking on a door that were too afraid of the rejection. But just keep knocking and knocking and knocking. Those are the types of risks. What’s … what does failure feels like when someone slams the door on your face? Ah Man. Another person that just doesn’t get it and doesn’t see what I see. But what I always do is I reflect. Here’s one of the pitching that I often do still. I get nos. I get rejection and I don’t like it. But part of the failure and the learning is calling up the press and saying, Oh, I’ve got a great story idea for you. Brian Scudamore: They go, oh, we don’t like it. I try and learn from their no. I say, well what don’t you like about it? What’s missing? What would make it a great story? They often give you the answers. They haven’t been persuaded. But they give you the answers you need for the next call or the next knocking on a door to get to success. It’s getting out of your comfort zone and having those failures. It’s not being afraid to fall, to fail, to look bad, to sound stupid. Just get out of your comfort zone. Mitch Matthews: I love that. I do love … Again with the book, you’re not talking about crazy blind leaps of faith all the time. There’s a couple in there. But for the most part it’s more steps of faith over time which I’m a huge fan of. We’re going to take a quick break and then I got a couple last questions that I’m dying to ask. So quick break and we’ll be right back. Speaker 2: I’ve got a question for you. Are you successful in your career? But at the same time, do you feel like there might be something better out there for you? Mitch Matthews recent bestselling book can help. It’s called Dream Job: Redefined. It’s based on over 200 interviews of people who either found or created their dream jobs. Mitch offers stories and real world strategies that will help you to define what a dream job is for you. Then you’ll have the tools you need to go out and get it. Dream Job: Redefined, the new rules for creating a career that matters and doing work you love. Find it on Amazon or visit dreamjobredefined.com to grab your copy today. Mitch Matthews: All right. We’re back. One of the questions I would love to ask authors, especially authors that have lived it, right? Sometimes your … you talk with someone who wrote a book and it’s, this is good theory. But I don’t know whether you lived it. You know what I mean? [inaudible 00:25:36] story. But, all right. Mitch Matthews: But in your case, I can definitely tell every one of those was hard fought battles. But I know when people go to write a book usually … especially when they put it together like you did. A number of specific strategies, steps, all of those things. I’m guessing that some of those strategies come more naturally to you. But as you think through the different strategies you cover in the book, what’s one of those that maybe didn’t come or doesn’t come as natural to you that you still have to be really intentional about, personally? Brian Scudamore: That’s interesting. It is my life. I’ve lived at for the last 30 years. There’s certainly moments of … There’s things that weren’t natural. I think leadership. I’ve always been a bit of a natural leader. But sometimes I’ve got to get more extroverted. I can often be an introvert. I need to recharge and be by myself for periods of time. It’s still … People look at me and they’re like, oh, you’re always branded. You’re always out there and energetic and fired up. That still takes work for me, surprisingly. I still have to turn it on. I’m still myself. But I’m just cranking up the high energy Brian. Then I get tired and then you get to see a little bit and take a bit of a break. I think working on sustaining my energy is sometimes more difficult. The thing that I think that comes most naturally to me in the book is probably the stories of imagining possibilities and big ideas and putting my belief in others that they can do anything they set their mind to. Brian Scudamore: I have this belief and I talk about it at the end of the book is … There’s a great difference between building a living and building a life. I think North Americans, we often put our emphasis on building a living. But really if you focus on building a life and stop worrying about things and money and just having fun and taking care of people, the money and the things come like you would have never imagined. I think that we’re all here for a reason to do great work on this planet. I think that when people really focus on making meaning, not just money, that’s when it just … Again, I love to use the word magic ’cause sometimes it just feels like magic. Brian Scudamore: That’s where that kicks in. Brian Scudamore: The billion makes it sound about money. Really it’s just a measurable size of scope of here’s what we’re trying to build together. It’s not about the money. It’s just a measurement of, hey, we want to build a big enough company that we believe we can inspire enough entrepreneurs to do some great things. Mitch Matthews: I love it. I just am sparked up. I was going to ask you one last question. But I gotta get this in there ’cause I just loved the story. Mitch Matthews: You mentioned it in your painted picture vision of you’re going to get on Oprah. I love this story in the book of how you tasked somebody with that. Just tell us a little bit of that story ’cause I’m sure … Again you had another example where you put it out there probably seemed audacious to some, crazy to others. But if you really believed it and made it happen … Just give us that quick story. I just love that story. Brian Scudamore: A fellow named Tyler Wright, great friend who we hired as our first PR hirer. Zero PR pitching experience. He had a ton of energy and a ton of focus and enthusiasm. He used to sit below this can you imagine wall we had where we said, can you imagine, with cool things on that wall that we want to do accomplish, being featured on the Oprah Winfrey show? He’s looking at it. Looking at it. You could just tell there was something setting into his brain where he’s, I’m going to make that happen. He would pitch on a regular basis through email, through phone calls. He would be creative. One day he stands up in the office and he goes, I did it. We got it. You’re just wondering why is this guy going nuts? He pitched successfully and landed it. Brian Scudamore: He was so determined he would do crazy things like put on a blue wig just to get in a crazy spirit of energy of I’m gonna make this thing happen. What I love about that story is we took someone with zero experience, gave him one of our biggest goals because he had the belief. His belief was much more important than my ability to execute because I don’t know if I would have stuck with the goal and executed as hard as it took to make it happen as Tyler did. Mitch Matthews: I love that. I love too that it wasn’t easy. He said it’s not two weeks from now, it’s not two months from now. It’s tomorrow. You guys made it happen, which is fantastic. Brian Scudamore: We didn’t even have trucks in that market. We weren’t in the Los Angeles market yet. That’s where they wanted to film us ’cause they had a hoarder that needed cleaning up. We had to be creative. We had to drive trucks from San Francisco, the nearest franchise. Get them to cancel their schedules and rally. You know what? We made it a party. We made it fun and it was a big, big deal for our brand. Mitch Matthews: I love it. I love it. Man, there’s just so many great stories. That’s just one of the other examples of it. The book is called WTF. You guys need to read it. Willing to Fail: How Failure Can Be Your Key to Success. Brian, one last question. We always ask for that last … wisdom of the week. What’s one last thing you’d share with somebody that’s on the fence? They’re all about it. They’re feeling it. They’re wanting to sit down and do that vision, get that picture in their mind. What’s one last piece of advice you might offer them? Brian Scudamore: Well, a lot of people think that they don’t have the ability to vision. So Cameron Herold, who I believe you’ve had on your podcast, he was our COO from 2 million to 106. Cameron said, oh, I can’t vision. I remember walking him through an exercise where I said, if you could take a vacation anywhere in the world tomorrow, money wasn’t an object, where would you go? He starts painting this picture of what it would look like and who’s on the beach with him and what he’s drinking. Everybody has the ability to use their imagination. You often just need someone to ask you questions. Brian Scudamore: So my advice … The wisdom if you will, is find a partner. Someone that can just sit beside you and go, okay, I’m going to ask you a bunch of questions about what that vision could look like. Well you see the picture. Why don’t you answer it and put it down on paper? Mitch Matthews: I love it. Never dream alone, right? Mitch Matthews: That’s awesome. Brian, thanks for doing what you do. Thanks for the example. Thanks for the book and keep bringing the awesome, my man. Brian Scudamore: Well thank you for including me, Mitch. You’d do a great job and tons of energy. You made it fun. Thank you. Mitch Matthews: Absolutely. All right, Dream, think, doer. What stood out to you? What’s something that struck you about what Brian had to share? I’d love to hear from you. Hit me up at mitchmatthews.com/221. Would love to hear what stood out to you. I know for me, something that really struck me was just getting away and painting that picture. That sounds easy. But it’s not always easy if you’ve done it. You know that it takes work. It takes guts. It takes some time. But I love it. I can tell you just for me, that just kind of resonated with me as a reminder. I think sometimes it’s about getting away and painting the original vision and that sometimes it’s about getting away and revisiting that vision. Kind of putting some new colors on the picture, right? Modifying it. Updating it. All of those things. Mitch Matthews: That’s something that struck me that I wanna be doing. I need to be doing. How about you? What’s something that stood out to you? I’d love to hear from you. Leave a comment below and let me know!